If you have any questions about the AEGINA information page below please contact us. The sailing yacht AEGINA is a superyacht of good sized proportions. This 33 metre (108 foot) luxury yacht was made by at Aegean Yacht Services in 1998. The yacht is a modern turkish gulet (gullet). Superyacht AEGINA is a well designed yacht that can sleep a total of 24 guests on board and has around 6 qualified crew. The naval architect that made this yacht's design work with respect to this ship was Aegean Yacht. The yacht's wider design collaboration came from Aegean Yacht. The technical naval architect plans are the products of Aegean Yacht. Created at Aegean Yacht Services this yacht was completed in Turkey. She was successfully launched in Bodrum in 1998 before being delivered to the owner. Her core hull was constructed with wooden/epoxy. The sailing yacht superstructure is fabricated largely with wood. The total length of the luxury yacht on deck is 33 (108.3 ft). With a beam of 8.8 metres / 28.9 ft AEGINA has fairly large size. She has a deep draught of 3.1m (10.2ft). The yacht for its propulsion uses two agile IVECO diesel engine(s) and can find a reasonable continuous speed of 12 knots. The engine of the AEGINA gives 190 horse power (or 140 kilowatts). Her total HP is 380 HP and her total Kilowatts are 280. AEGINA is propelled by twin screw propellers. With chambers for a limit of 24 welcome guests sleeping aboard, the AEGINA accommodates everyone comfortably. Under normal conditions she utilises approx 6 proficient yacht crew to operate. Her Engine(s) is two 190 HP / 140 Kilowatts Iveco. 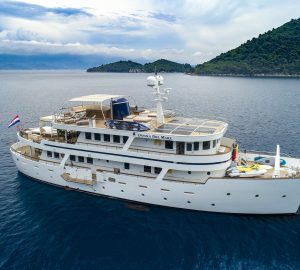 The luxury yacht AEGINA displayed on this page is merely informational and she is not necessarily available for yacht charter or for sale, nor is she represented or marketed in anyway by CharterWorld. This web page and the superyacht information contained herein is not contractual. All yacht specifications and informations are displayed in good faith but CharterWorld does not warrant or assume any legal liability or responsibility for the current accuracy, completeness, validity, or usefulness of any superyacht information and/or images displayed. All boat information is subject to change without prior notice and may not be current.